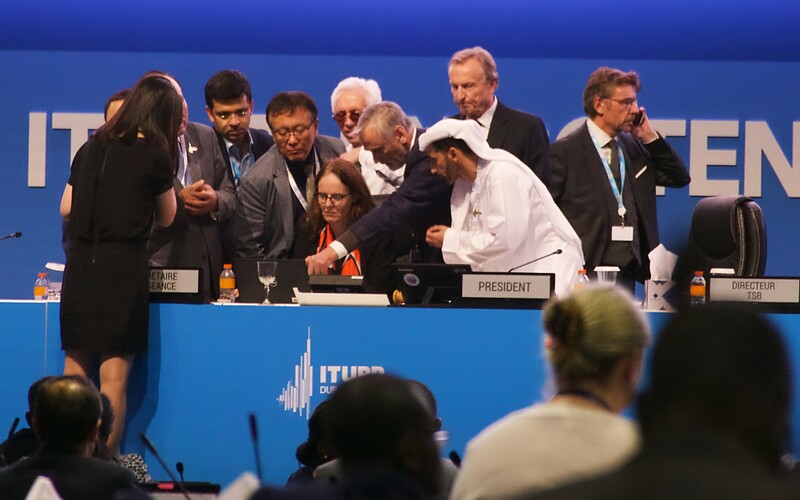 Note: I am attending the ITU Council 2014 meeting as a member of the Australian delegation; however, any of the views I express in this blog post are entirely my own. This post does not reflect the official Australian position, nor is its content endorsed in any way by the Australian government. Over 500 people registered to attend Council 2014, but the main room only accommodates 260, so the overflow is being sent to Room C.
This being the year of the Plenipotentiary Conference, with its many elections for various positions within the ITU, five government ministers—from Australia, Cameroon, Egypt, Ghana and Mali— are gracing the ITU Council 2014 with their presence. The Council continued the tradition of electing the previous year’s Vice-Chair to the position of this year’s Chair position. Mr Aboubakar Zourmba of Cameroon, therefore, is the Chair of ITU Council 2014. Following the tradition of ensuring geographic diversity, it is the turn of Region E (Asia and Australasia) to hold the position of Vice-Chair. Secretary General Toure will report back soon on which member of the Asia Pacific region will hold the position. Australia’s Caroline Greenway was re-elected as Chair of the Standing Committee on Administration and Management (excuse me while I’m parochial for a minute… Aussie, Aussie, Aussie! Oi! Oi! Oi!) Marcin Krasuski (Poland) and Vernita Harris (USA) will also continue their roles as Vice-Chairs in 2014. The Council session has received 26 contributions by Member States. 17 of these were submitted by the deadline (22 April, which is two weeks before the meeting starts). 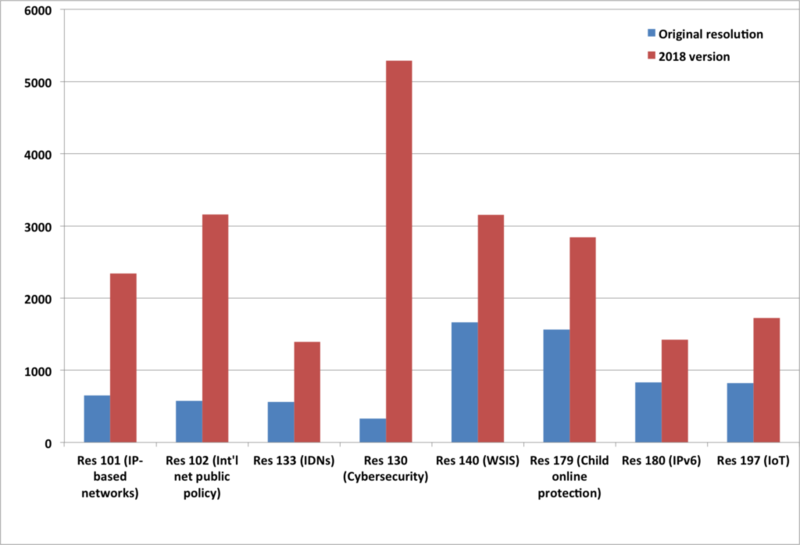 You can find who submitted what and when at the Contributions index page). Freely available versions of all Council 2014 documents have been made available on the WCITLeaks website. This really is low hanging fruit issue that is impossible for anyone to object to. Like the whole “think of the children”/child online protection issue, anyone who objects to activities that help a group of people with intellectual or physical disabilities really is entering Cruella De Vil territory. Of interest, though, was a suggestion by a Member State to use the term “disabilities and specific needs” in all future ITU documents on this issue (this term made its first appearance in the ITU context in the documents of the recent WTDC-14 held in Dubai). After the protracted debate on the equal participation of women in Internet governance at last week’s CSTD WGEC (I’m still to blog on this… watch this space), it was a relief to hear overwhelming support by the Council members for the need to encourage equal participation of women in the ITU sphere. It was less encouraging that of the seven interventions from the floor supporting the ITU’s work in this area, six of the interventions were made by men. 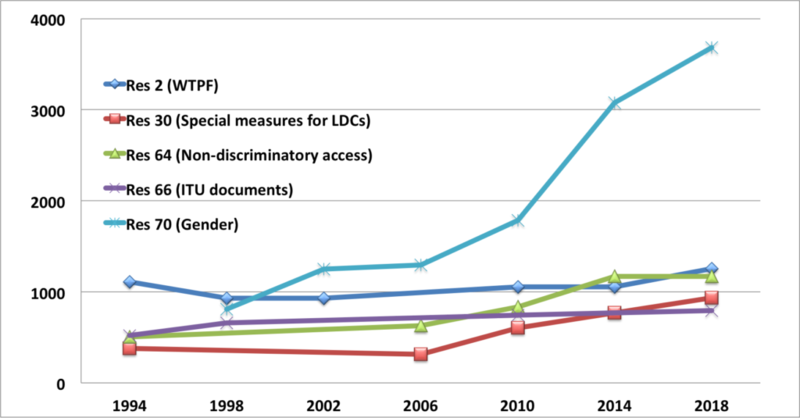 The ITU Secretariat provided some historical data on women’s participation in ITU (and its previous incarnations). The first woman to take the floor was from the Soviet Union during a 1932 meeting (that’s 67 years after the creation of International Telegraph Union). And the first woman to be a head of delegation was from Bolivia, in 1962 (97 years after the creation of the Union). 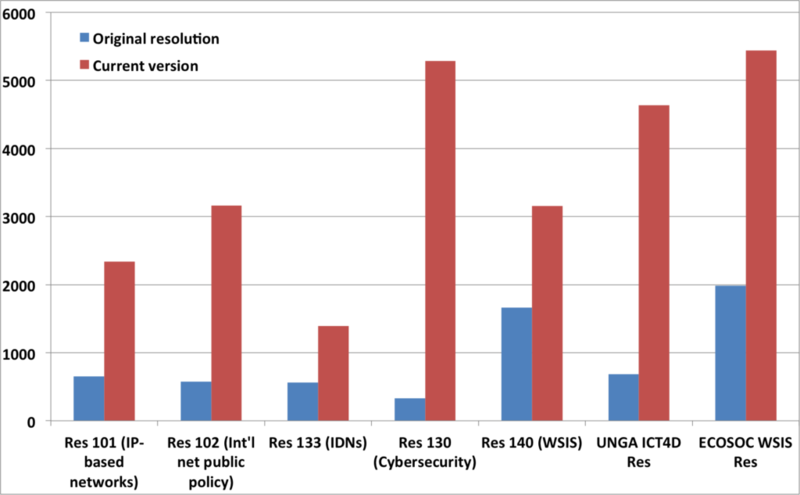 These statistics aren’t published on the ITU website yet, but the staff responsible for implementing Plenipotentiary Resolution 70 (Rev. Guadalajara, 2010) are compiling more information about the history of women’s participation in ITU and the result of that work will hopefully be published on the ITU website in some form soon. 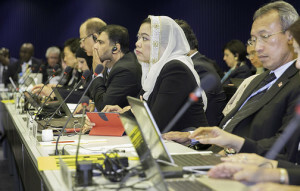 A written statement by ITU Secretary General Touré, read out by Deputy Secretary-General Houlin Zhou, noted that the implementation of gender mainstreaming was a high priority for ITU in 2014. As part of its gender mainstreaming activities, ITU will be launching the GEM (Gender Equality and Mainstreaming) awards at a side event on gender issues during ITU Plenipotentiary Conference 2014 (PP-14). 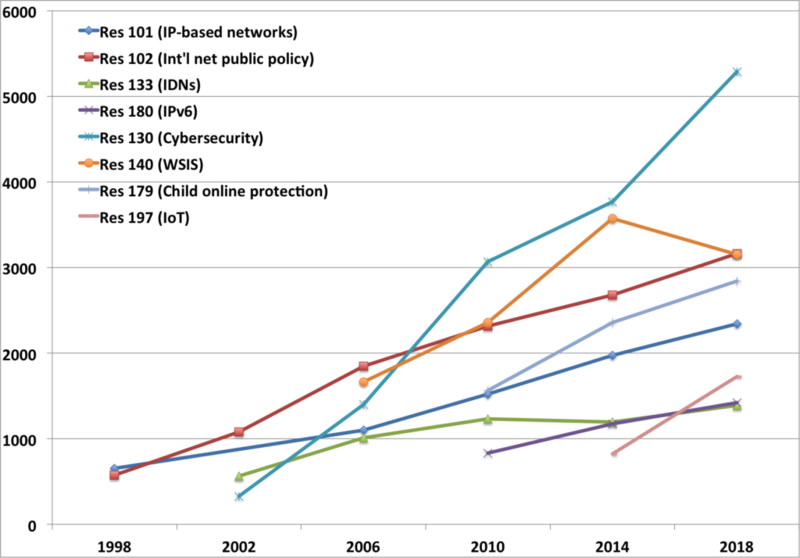 While ITU has expanded the number of publications available for free, in 2013, its revenues from the sale of publications increased when compared to the previous year’s sales. 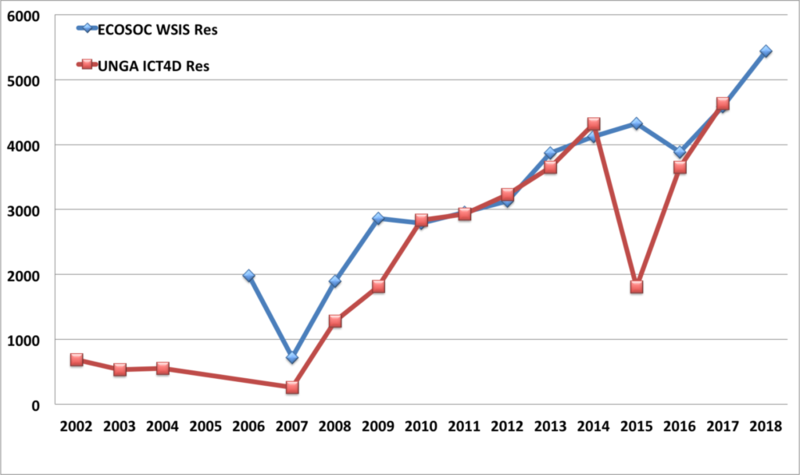 Interestingly, CDs and DVDs have experiences the largest growth in sales since 2009, with the overall sales of paper-based publications dropping dramatically between 2010 and 2012. Paper-based publications doubled in sales between 2012 and 2013 however (13% to 26% of sales). Sale of online publications (downloadable formats such as PDFs) has remained extremely small (only 1% of publication sales in 2013). 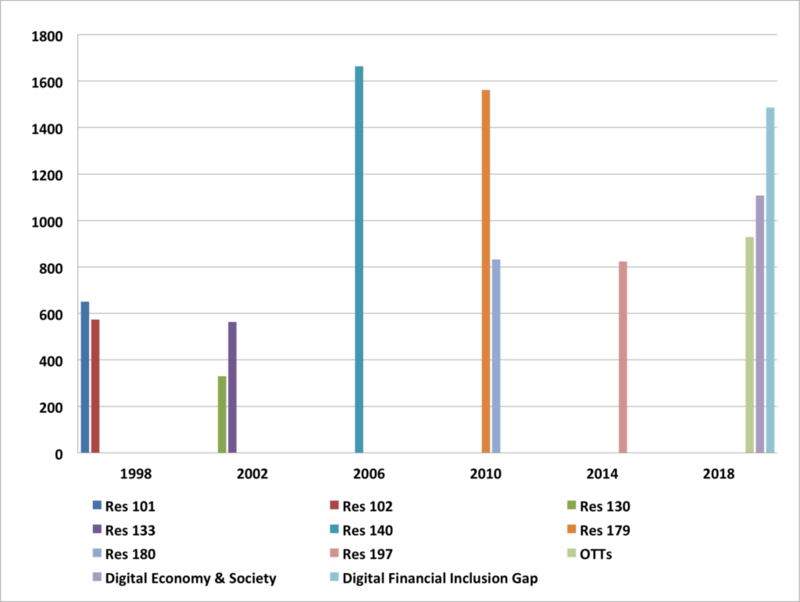 These figures are important because ITU is considering how many other publications to make freely available and how much free availability of documents will affect ITU’s income stream. There were some concerns expressed in the room that additional free documents could have a negative impact on ITU’s budget (ITU is already trying to work out how to do an expanding list of things its members want it to do while also juggling budget constraints). Based on the discussions on Day 1, a draft proposal to make additional documents available freely will be amended by the author State and another interest State. 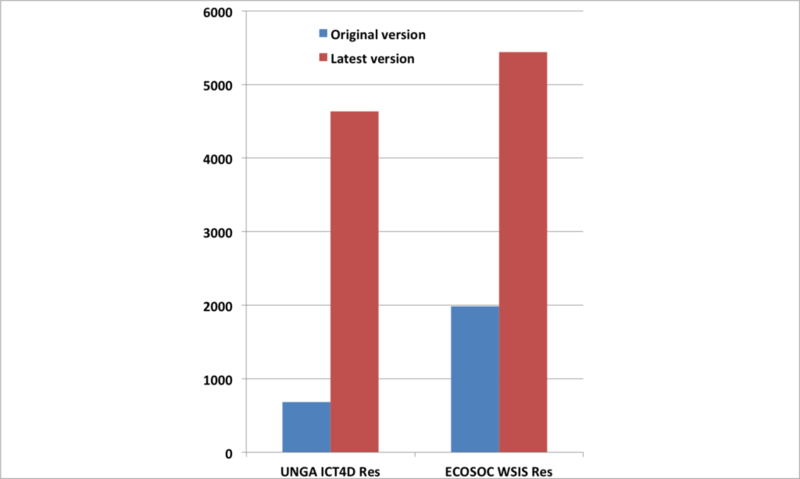 There were two documents submitted by the CWG: C38, which was an overall report on WSIS activities by the ITU, and an Addendum to C38 (which was a report on the CWG’s meeting held on Monday, 5 May 2014). There was a bit of discussion over the way that the Council would take action on the two documents: it was proposed that C38 be “noted” while C38 Addendum 1 be “approved”. 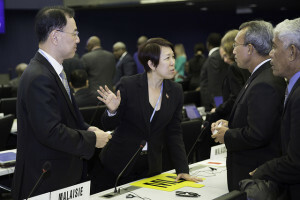 Some Member States were reluctant to “approve” the Addendum, given it was a mix of summary paragraphs on the Monday meeting as well as proposals on the way forward. But when the Chair pushed for closure on the topic, asking if anyone had strong objections to the document, Member States kept silent, so the document was approved. Technologies and equipment that handle (e.g., access, create, collect, store, transmit, receive, disseminate) information and communication. The report of the Correspondence Group is meant to be forwarded to the PP-14 for their consideration, but a number of Council members objected to the definition being included in the report as they felt that the definition was not yet “mature” enough. 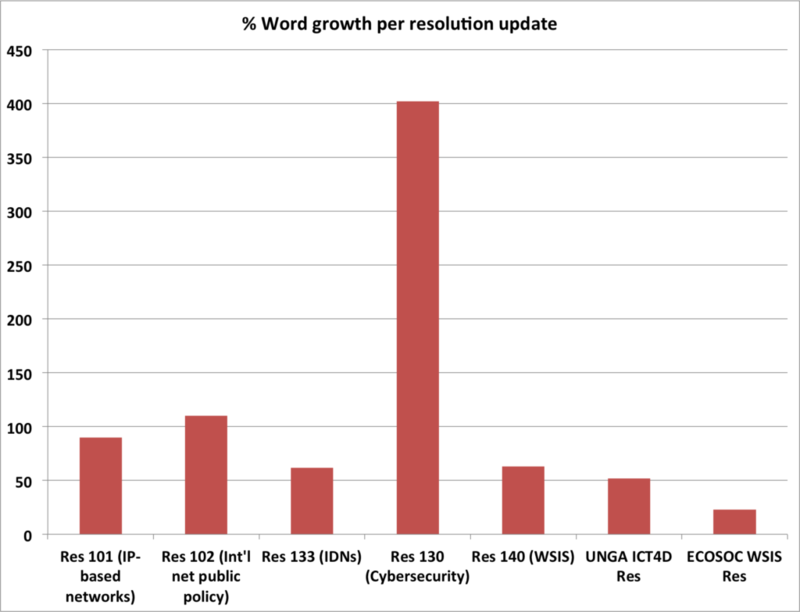 The Chair intervened with “We’ve been discussing this since 2006 and still don’t have a definition of ICT.” Other Member States said that that since the Correspondence Group had been tasked with coming up with a definition by the last Plenipotentiary Conference (in 2010), it was important to report back to PP-14 on the status of its work, even if the current definition wasn’t the final one. 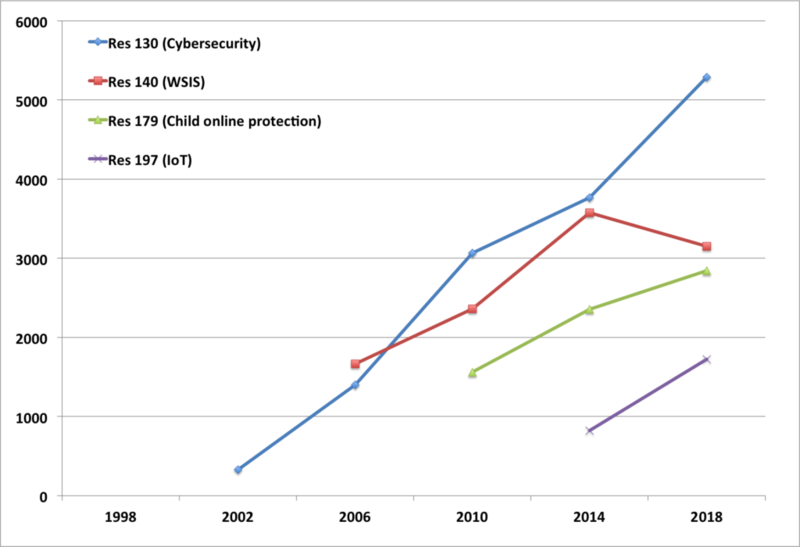 A couple of States supported the idea of submitting the report of the Correspondence Group along with a summary of the discussion about the definition of ICTs held here in Council. The day ended with the Chair proposing that a small group get together and work on the definition outside of plenary in the hope of finding a consensus solution. 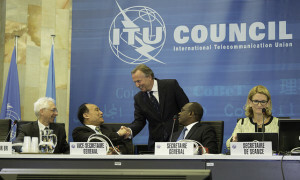 Official ITU language only recognizes the terms “Chairman” and “Vice-Chairman”. However, I am not similarly constrained to use such gender-biased terms, and will only use “Chair” and “Vice-Chair”… even if the positions are still overwhelmingly filled by men.